2019 Best Chemistry Colleges in the U.S. There are around 16,173 college students earning a degree in Chemistry a year. This makes it 32nd most well liked out of 384 total majors in our database. Positioned 33 out of 121 total majors in regards to possible income, Chemistry graduates generate around 6.0% more than most college grads. To be specific, Chemistry grads record normal early career income of $42,628 and mid-career salary of $81,101 . The following list ranks the best colleges and universities in the U.S. for a Chemistry degree. Our ranking methodology takes into account factors such as education quality, average earnings of graduates, accreditation, and several other relevant factors. California Institute of Technology is the top choice if you're interested in a degree in Chemistry. Graduates of the chemistry program state that they receive average early career income of $50,779 and mid-career income of $96,861. Positioned in Pasadena, California, this school is a strong choice for students who enjoy the exhilaration of a substantial city. Massachusetts Institute of Technology is one of the best schools in the United States for Chemistry. In addition to its bachelor's programs, Massachusetts Institute of Technology offers graduate degrees in Chemistry. Cambridge, Massachusetts is an ideal area for learners who enjoy the fast-paced city life. It's hard to beat Harvard University if you want to pursue Chemistry as a major. Harvard University chemistry majors make 55.2% more than the standard chemistry grad. This school is one of the largest schools in Massachusetts. It's hard to find a better school than Princeton University if you wish to pursue Chemistry as a major. After graduation, chemistry students typically make around $52,296 in the first five years of their career. Located in Princeton, New Jersey, Princeton supplies a safe and sound, suburban atmosphere for learners. University of California - San Diego is among your top options if you want to study Chemistry. Students who graduate from the chemistry program make about $46,107 in their early career salary and $92,929 in their mid-career salary. University of California - San Diego is among the largest schools in California. Any student pursuing a degree in Chemistry has to take a look at Yale University. Students from the chemistry major at Yale University get 38.4% above the average college grad with the same degree. The setting in a large urban center is great for students seeking out considerable options for social networking, excitement, and exploration. University of Chicago is among your best bets if you want to study Chemistry. University of Chicago chemistry students make 7.0% more than the average chemistry grad. Located in Chicago, Illinois, this university is optimum for young people who flourish in an urban setting. It's hard to find a better school than Cornell University if you wish to pursue Chemistry as a major. In addition to its bachelor's programs, Cornell University offers graduate degrees in Chemistry. Ithaca, New York is an ideal environment for college students who enjoy the fast-paced urban lifestyle. It's hard to find a better school than Duke University if you wish to pursue Chemistry as a major. In addition to its bachelor's programs, Duke University offers graduate degrees in Chemistry. The setting in a big urban center is wonderful for students seeking ample chances for networking, experience, and discovery. It is difficult to beat University of Florida if you want to pursue Chemistry as a major. 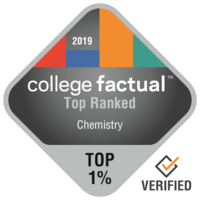 Students from the chemistry major at University of Florida get 8.5% more than the standard graduate with the same degree. Located in Gainesville, Florida, this school is a good choice for students who enjoy the thrill of a significant city.